According to Dan Feihn, group CIO and IT director at Marketstudy, "there will be a total of 23 million autonomous cars by 2035." However, despite the increasing numbers on autonomous cars on the road, they are still dominated by "traditional" cars driven by a human. The transportation industry is moving rapidly with technological disruptions happening in every area, including in insurance, which has an entire tech sector devoted to it -- InsurTech. However, Gartner also found that 30% of insurance systems are using 20-year-old software. This is an area poised for technical innovation and disruption. The solution? Introducing smart algorithms and IoT video technology to vehicles to assist insurance companies with claims and subsequent payouts. Video footage and IoT data is able to hugely enhance customer understanding about both driving and their car, and assist companies in understanding individuals vehicles. By installing cameras inside and outside the car, insurance companies can utilize this data to predict and stop accidents before they happen. A front-facing camera can detect when a driver is distracted by answering a phone, yawning or closing their eyes. This type of innovative technology is not only turning insurance on its head; it is keeping drivers safe and forcing them to be more responsible when driving. 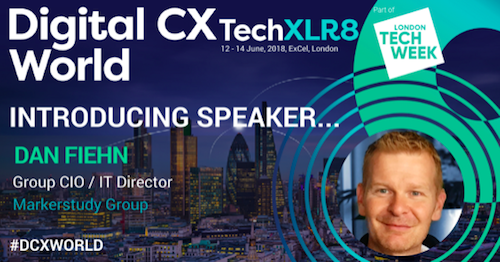 Feihn highlighted how focusing on delivering the best customer and user experience contributed to a huge internal cultural shift, which in turn laid the foundations for future digital transformation and in turn providing a better customer experience. He also looked at how to utilize data analytics to inform competitive insurance quotes, which paved the way to embracing machine learning to improve intelligent product, service and process innovation.